November. Veteran's Day. There are so many books coming out covering WWII. DK books are special, however, and I want my whole youth back so I can ask for the entire series for Christmas. 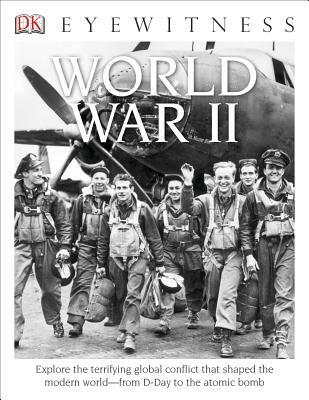 This book gives an overview of the war with great photos and artifacts. Interest someone you know in history or take a gander yourself. Easy to dip in and out of, but a wealth of knowledge. Honor our veterans, read! Discover the war that shaped the modern world in Eyewitness: World War II. From the pre-war rise of Nazi Germany to the start of the war with the invasion of Poland in 1939 to Japan singing the surrender agreement in 1945, all aspects of the deadliest conflict in human history are covered in great detail with content that is accessible and appropriate for young readers. For over 25 years, DK's Eyewitness books for children have been the most trusted nonfiction series in classrooms, libraries, and homes around the world. In summer 2014 this award-winning series will get a fresh new look both inside and out. The introduction of paperback editions, eye-catching jackets, and updated interiors ensure that the Eyewitness series will continue to be relevant in the ever-changing world of education and remain the go-to source for homework help, research projects, reluctant readers, ESL students, and, as always, to satisfy the minds of curious kids. Simon Adams earned his degree in politics and history at the London School of Economics, and then studied as a postgraduate at Bristol University. He has written and edited more than 50 children’s books about history, archaeology, geography, and famous people, among other subjects.